Gadfly site Propublica has a fascinating—and depressing—story about how Chesapeake Energy, the largest independent gas producer in the county and one of the pioneers of fracking for natural gas in the Marcellus region, essentially created $5 billion from an accounting trick and paid for it by gouging the owners of the land they're drilling on. To understand what happened here, you have to understand how oil and gas royalties work. Drillers agree to pay landowners a percentage of their profits, but as with deals in the record business, the devil is in the details. 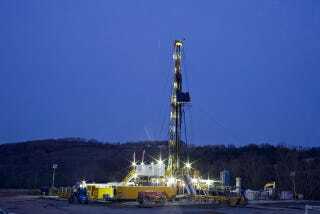 When energy companies lease land above the shale rock that contains natural gas, they typically agree to pay the owner the market price for any gas they find, minus certain expenses. Federal rules limit the tolls that can be charged on inter-state pipelines to prevent gouging. But drilling companies like Chesapeake can levy any fees they want for moving gas through local pipelines, known in the industry as gathering lines, that link backwoods wells to the nation's interstate pipelines. Property owners have no alternative but to pay up. There's no other practical way to transport natural gas to market. Chesapeake needed cash, fast, but regular channels were not available. McClendon came up with a doozy of a solution. The company spun off its regional pipeline assets into a new company, raising about $4.8 billion. But that left the new company with a nearly $5 billion hole in its balance sheet. Chesapeake agreed to ship all its gas through the new company's pipelines (something it was doing already, since the pipelines used to belong to Chesapeake), but at greatly inflated tolls—something like three times what they had been. Chesapeake then turned around and passed the new, inflated expenses on to the landowners. The effect was to drastically reduce the royalty checks the landowners were getting, in some cases by almost 90%. That money went to pay back the debt on the new company, debt that was incurred to raise $5 billion in cash for Chesapeake. Days after the last of the deals closed, Drake and other landowners learned the expense of sending their gas through Access's pipelines would eat up nearly all of the money they had been previously earning from their wells. Some saw their monthly checks fall by as much as 94 percent. An executive at a rival company who reviewed the deal at ProPublica's request said it looked like Chesapeake had found a way to make the landowners pay the principal and interest on what amounts to a multi-billion loan to the company from Access Midstream. Not surprisingly, neither company, nor McClendon—who is still making waves in the gas business—was willing to comment on the story. Pennsylvania governor Tom Corbett is trying to get the state attorney general to open an investigation as a result of this and other shenanigans. The full piece, though long, is well worth reading.